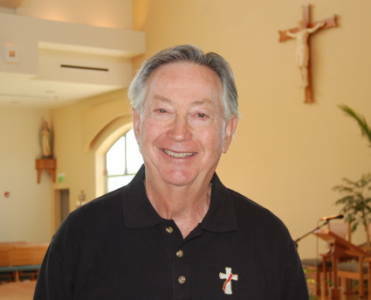 Deacon Dave Pecot has been at St. Thomas the Apostle parish since April 2010. He was ordained a Catholic deacon on May 23, 1998 in Cleveland, Ohio. Dave was born December 19, 1939 in Eunice, Louisiana the third of eight children of Helen Donegan and Joseph H. Pecot, Jr. The family moved to New Orleans, Louisiana where Dave attended Fortier High School and graduated from LSU in January 1963. Dave and Anne Marie Liles married on September 8, 1962 and they had five children Michelle Kazanjian (John), Renee McKeone (Joe), David, Laura Redman (Steve) and Mark. The families of their children include Mary Beth Kazanjian, Ani Kazanjian, Gina Kazanjian, Christieann Kazanjian, Tasha Kazanjian, Claire McKeone, Pat McKeone, Mara McKeone, Kateri McKeone, Henry Redman and Sam Redman. Dave worked 21 years for the Eveready Battery Products Division of Union Carbide with nine of those years spend in the countries of Malaysia and Singapore. He and his family lived in Charlotte and Greenville North Carolina, Bennington Vermont and Ohio. He left Union Carbide after moving to Cleveland in 1983 and joined the Nymold Division of Ethyl Molded Products Company as General Manager. In 1988, he joined Weatherchem Corporation as Vice President of Manufacturing retiring in May of 2000. Dave first considered applying for the diaconate in 1976, after his pastor in Bennington, Vermont encouraged him to become a deacon. That decision was put on hold as he was continually being transferred by Union Carbide until he finally decided to pursue that calling in 1995. Dave attended formation classes at the Center for Pastoral Leadership and was ordained as a permanent deacon in the Diocese of Cleveland on May 23, 1998 by Bishop Anthony Pilla. He was immediately assigned to St. Basil the Great as a Pastoral Minister.